Anaplastic lymphoma kinase (ALK) and c-ros oncogene 1 (ROS1) are related receptor tyrosine kinases (RTKs). Research studies have identified ALK and ROS as mutant C-terminal fusion proteins that are expressed in a wide range of cancers (1-10). Table 1 lists some of the ALK and ROS1 fusion partners that have been identified and the associated cancer types. Rikova, K. et al. (2007) Cell 131, 1190–1203. Takeuchi, K. et al. (2008) Clin Cancer Res 14, 6618–6624. Birch, A.H. et al. (2011) PLoS One 6, e28250. Rimkunas, V.M. et al. (2012) Clin Cancer Res 18, 4449–4457. D’Arcangelo, M. et al. (2013) Curr Opin Oncol 25, 121–129. Takeuchi, K. et al. (2009) Clin Cancer Res 15, 3143–3149. Morris, S.W. et al. (1994) Science 263, 1281–1284. Charest, A. et al. (2003) Genes Chromosomes Cancer 37, 58–71. Stumpfova, M. and Jänne, P.A. (2012) Clin Cancer Res 18, 4222–4224. Gu, T.L. et al. (2011) PLoS One 6, e15640. Cell Signaling Technology recommends two highly sensitive antibodies for detection of ALK and ROS1 full-length proteins and C-terminal fusion proteins. C-terminal Epitopes – enable detection of full-length protein and C-terminal fusion oncoproteins. Highly Sensitive Antibodies – allow detection of endogenous levels of ROS1 or ALK. No Cross-reactivity with Other Family Members – ensures specific detection of ROS1 or ALK protein. Rabbit Monoclonal Antibodies – CST’s proprietary XMT® technology allows careful selection of antibodies for relevant applications. 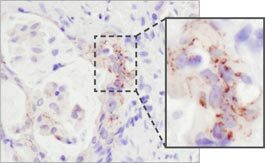 Immunohistochemical analysis of paraffin-embedded human lung carcinoma using ROS1 (D4D6) Rabbit mAb #3287. Note: Staining is of FIG-ROS1 fusion (4). Western blot analysis of extracts from HCC78 (SLC34A2-ROS1), U-118 MG (FIG-ROS1), and HeLa (ROS1 negative) cells using ROS1 (D4D6) Rabbit mAb #3287 (upper) or β-Actin (D6A8) Rabbit mAb #8457 (lower). 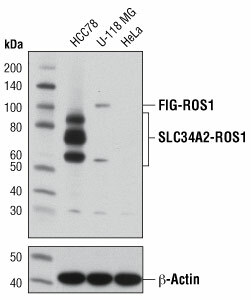 Note: HCC78 cells express the 85, 70, and 59 kDa forms of the SLC34A2-ROS1 fusion protein (1). 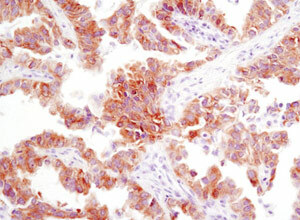 Immunohistochemical analysis of paraffin-embedded human lung carcinoma using ALK (D5F3) XP® Rabbit mAb #3633. Western blot analysis of extracts from NCI-H2228 and NCI-H3122 cells using ALK (D5F3) XP® Rabbit mAb #3633. 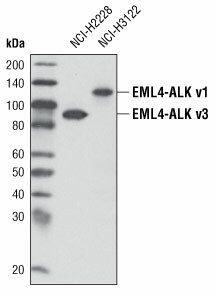 Variants denoting fusions of different EML4 exons (v1 or v3) are indicated. CST performed an unbiased, large-scale survey of tyrosine kinase activity in lung cancer using PTMScan® Technology. 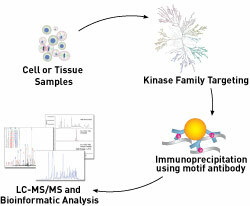 This proprietary technology, developed at Cell Signaling Technology(11), uses a CST™ Motif Antibody for immunoaffinity purification of peptides from digested cell extracts combined with LC tandem mass spectrometry to identify and quantify changes in post-translational modifications such as phosphorylation, acetylation, or ubiquitination. For this study, we used a phospho-tyrosine motif antibody to analyze changes in phosphorylation across the proteome in NSCLC cell lines and tissues. Using PTMScan® Technology, we surveyed the phosphotyrosine status of receptor tyrosine kinases (RTK) and non-receptor tyrosine kinases in 41 NSCLC cell lines and over 150 NSCLC tumors. Over 50 tyrosine kinases and more than 2,500 downstream substrates that play roles in NSCLC growth and progression were identified. Two very exciting findings from this study were the identification of novel anaplastic lymphoma kinase (ALK) and c-ros oncogene 1 (ROS1) C-terminal fusion proteins in some NSCLC cell lines and tumors. Rabbit monoclonal antibodies specific to ALK and ROS1 [ALK (D5F3) XP® Rabbit mAb #3633; ROS1 (D4D6) Rabbit mAb #3287] were developed to detect both full-length and C-terminal fusion proteins. These antibodies have been validated for IHC and can detect ALK and ROS1 fusion protein expression in NSCLC sample(12, 4). 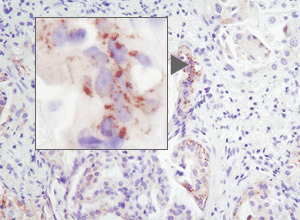 IHC analysis of paraffin-embedded human lung carcinoma using ROS1 (D4D6) Rabbit mAb #3287. Note: Staining is of FIG-ROS1 fusion protein(4). A partnership with Pfizer, Inc., creator of the ALK inhibitor crizotinib, and Ventana Medical Systems, Inc., a leader in companion diagnostic testing, was formed to develop the use of ALK (D5F3) XP® Rabbit mAb in an automated diagnostic IHC screening assay to detect ALK fusion proteins in NSCLC patient samples. Patient samples that stain positive for ALK expression may be candidates for crizotinib, which was approved for use in the U.S. in August 2011. 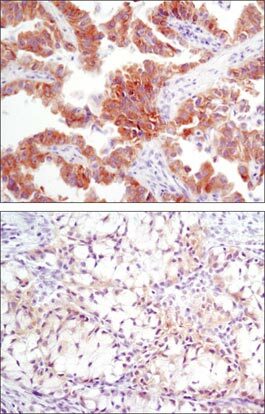 IHC analysis of paraffin-embedded human lung carcinoma with high (upper) and low levels (lower) of ALK expression using ALK (D5F3) XP® Rabbit mAb #3633. CST scientists are highlighted in bold. Katayama R, Shaw AT, Khan TM, Mino-Kenudson M, Solomon BJ, Halmos B, Jessop NA, Wain JC, Yeo AT, Benes C, Drew L, Saeh JC, Crosby K, Sequist LV, Iafrate AJ, Engelman JA (2012) Mechanisms of acquired crizotinib resistance in ALK-rearranged lung Cancers. Sci Transl Med 4(120), 120ra17. Ren H, Tan ZP, Zhu X, Crosby K, Haack H, Ren JM, Beausoleil S, Moritz A, Innocenti G, Rush J, Zhang Y, Zhou XM, Gu TL, Yang YF, Comb MJ (2012) Identification of anaplastic lymphoma kinase as a potential therapeutic target in ovarian cancer. Cancer Res. 72(13), 3312–23. Rimkunas VM, Crosby KE, Li D, Hu Y, Kelly ME, Gu TL, Mack JS, Silver MR, Zhou X, Haack H (2012) Analysis of Receptor Tyrosine Kinase ROS1-Positive Tumors in Non-Small Cell Lung Cancer: Identification of a FIG-ROS1 Fusion.Clin. Cancer Res. 18(16), 4449–57. Gu TL, Deng X, Huang F, Tucker M, Crosby K, Rimkunas V, Wang Y, Deng G, Zhu L, Tan Z, Hu Y, Wu C,Nardone J, MacNeill J, Ren J, Reeves C, Innocenti G, Norris B, Yuan J, Yu J, Haack H, Shen B, Peng C, Li H, Zhou X, Liu X, Rush J, Comb MJ (2011) Survey of tyrosine kinase signaling reveals ROS kinase fusions in human cholangiocarcinoma. Carretero J, Shimamura T, Rikova K, Jackson AL, Wilkerson MD, Borgman CL, Buttarazzi MS, Sanofsky BA, McNamara KL, Brandstetter KA, Walton ZE, Gu TL, Silva JC, Crosby K, Shapiro GI, Maira SM, Ji H, Castrillon DH, Kim CF, García-Echeverría C, Bardeesy N, Sharpless NE, Hayes ND, Kim WY, Engelman JA, Wong KK (2010) Integrative genomic and proteomic analyses identify targets for Lkb1-deficient metastatic lung tumors. Cancer Cell 17(6), 547-59. Boccalatte FE, Voena C, Riganti C, Bosia A, D'Amico L, Riera L, Cheng M, Ruggeri B, Jensen ON, Goss VL, Lee K,Nardone J, Rush J, Polakiewicz RD, Comb MJ, Chiarle R, Inghirami G (2009) The enzymatic activity of 5-aminoimidazole-4-carboxamide ribonucleotide formyltransferase/IMP cyclohydrolase is enhanced by NPM-ALK: new insights in ALK-mediated pathogenesis and the treatment of ALCL. Blood 113(12), 2776-90. Yu J, Kane S, Wu J, Benedettini E, Li D, Reeves C, Innocenti G, Wetzel R, Crosby K, Becker A, Ferrante M,Cheung WC, Hong X, Chirieac LR, Sholl LM, Haack H, Smith BL, Polakiewicz RD, Tan Y, Gu TL, Loda M, Zhou X, Comb MJ (2009) Mutation-specific antibodies for the detection of EGFR mutations in non-small-cell lung cancer.Clin. Cancer Res. 15(9), 3023-8. Guo A, Villén J, Kornhauser J, Lee KA, Stokes MP, Rikova K, Possemato A, Nardone J, Innocenti G,Wetzel R,Wang Y, MacNeill J, Mitchell J, Gygi SP, Rush J, Polakiewicz RD, Comb MJ (2008) Signaling networks assembled by oncogenic EGFR and c-Met. Proc. Natl. Acad. Sci. U.S.A. 105(2), 692-7. Rikova K, Guo A, Zeng Q, Possemato A, Yu J, Haack H, Nardone J, Lee K, Reeves C, Li Y, Hu Y, Tan Z,Stokes M, Sullivan L, Mitchell J, Wetzel R, Macneill J, Ren JM, Yuan J, Bakalarski CE, Villen J, Kornhauser JM,Smith B, Li D, Zhou X, Gygi SP, Gu TL, Polakiewicz RD, Rush J, Comb MJ (2007) Global survey of phosphotyrosine signaling identifies oncogenic kinases in lung cancer. Cell 131(6), 1190-203. Rush J, Moritz A, Lee KA, Guo A, Goss VL, Spek EJ, Zhang H, Zha XM, Polakiewicz RD, Comb MJ (2005)Immunoaffinity profiling of tyrosine phosphorylation in cancer cells. Nat. Biotechnol. 23(1), 94-101. Hornbeck PV, Chabra I, Kornhauser JM, Skrzypek E, Zhang B (2004) PhosphoSite: A bioinformatics resource dedicated to physiological protein phosphorylation. Proteomics 4(6), 1551-61. Zhang H, Zha X, Tan Y, Hornbeck PV, Mastrangelo AJ, Alessi DR, Polakiewicz RD, Comb MJ (2002) Phosphoprotein analysis using antibodies broadly reactive against phosphorylated motifs. J. Biol. Chem. 277(42), 39379-87.